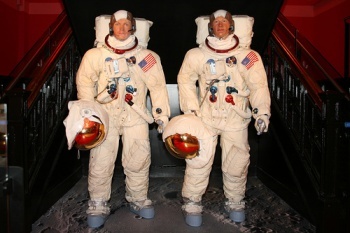 The venerable astronaut went before Congress and lamented the space program's current state. The space shuttle program that was at one time the pride of this nation in the 20th century was officially scrapped earlier this year, leaving the United States no way to reach orbit without depending on their old Cold War rivals. Hitching a ride with the Russians to reach the international space station (ISS) or any other destination outside Earth's atmosphere is absolutely unacceptable to the men who made history walking on the moon in 1969. Neil Armstrong addressed his concerns before Congress in Washington D.C. yesterday. "For a country that has invested so much for so long to achieve a leadership position in space exploration and exploitation, this condition is viewed by many as lamentably embarrassing and unacceptable," said the 81-year-old Armstrong. The private sector might be the best hope for Americans to reach space, but the four-member panel of astronauts believes that the United States is making a grave mistake by no longer investing manned space exploration. The nationalist pride the US won by beating the Russians to the Moon is exactly what the country needs right now. "A lead, however earnestly and expensively won, once lost, is nearly impossible to regain," Armstrong said. "As unimaginable as it seems, we have now come full circle and ceded our leadership role in space back to the same country - albeit by a different name - that spurred our challenge five decades ago," said Eugene Cernan, the last man to walk on the Moon in 1972. Cernan thinks that it's not too late to reinstate the space shuttle. "You want a launch vehicle today that will service the ISS? We've got it sitting down there. So before we put it in a museum, let's make use of it. It's in the prime of its life, how could we just put it away?" he asked Congress. "Get the shuttle out of the garage down there at Kennedy [Space Center], crank up the motors and put it back in service," Cernan implored. The image of a panel of old men who have actually walked on the moon demanding that we bring back the space program is strange to imagine, and I can't help but see NASA's decline as the decline of American civilization. Also, it's pretty cool that Buzz Aldrin once punched a guy in the face for claiming that the Apollo moon landing was faked. I wish he had appeared on the panel and done that to the Senators and Congressmen in the panel. I feel like that would make the astronauts' point much better.